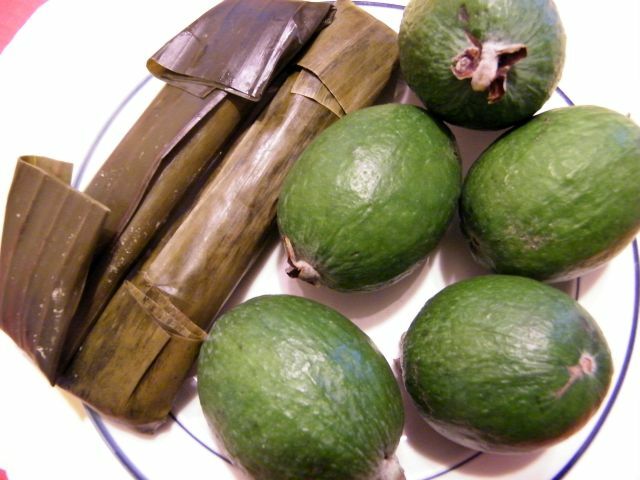 For my merienda (snack), I had two things that I like the most: suman and feijoas, one natively Filipino, the other a Kiwi seasonal fruit. The suman (rice cake) was bought from a stall right after the Filipino mass last Sunday. Yup, even in small measures we have a bit of semblance of Filipino life here. One thing I truly miss on Sundays is buying rice cakes right after mass. We have Filipino mass once a month in our region, and on this day some enterprising Filipinos sell a variety of food such as chicharon, dinuguan, kutsinta, and loads more. It's a bit expensive (the suman, for example, costs $5.00 for 4 pieces), but sometimes your Filipino tummy gets the better side of reason and you simply have to give in. The local fruit I found to my liking (aside from the kiwifruit) is the feijoa. I had a taste of this fruit last year and had been looking forward to it ever since. I actually thought it was a summer fruit and was already checking out fruit stands for it since December. I just learned it becomes available in late autumn. The taste is a combination of two fruits available in our country. The fleshy part resembles strongly of guava. 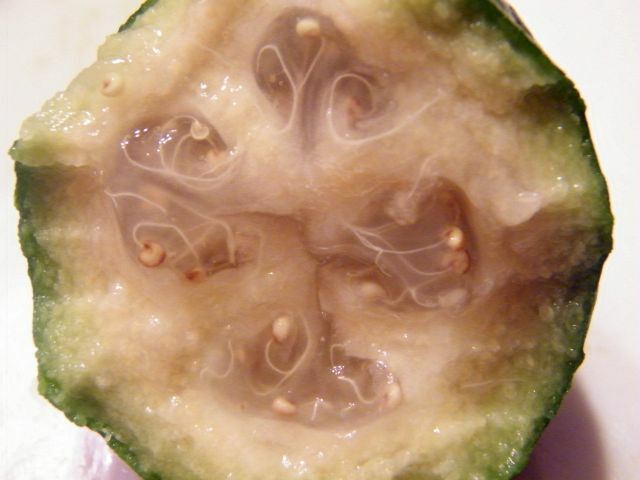 But when you get to the center where the seeds are, you get the taste of passion fruit. I like it a lot! I'll get some more feijoas when I'm through with this batch. I'll have to wait for another year before I get my next feijoa fix. As for the suman, we can always find an excuse to celebrate and cook some bico! This is the first time I've learned of Feijoas, I wonder if there is a store that supplies these fruits here in the Philippines.